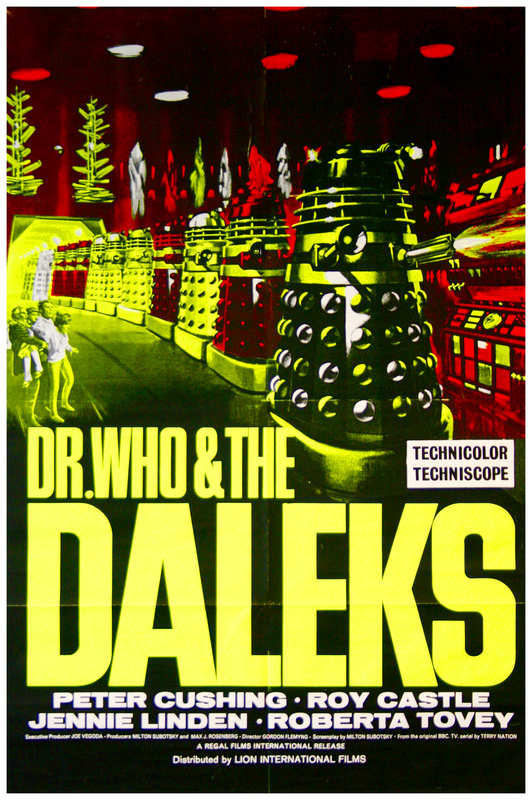 Dr. Who and the Daleks (1965) and Dalek’s Invasion Earth 2150 A.D. (1966) movie posters | 'TAIN'T THE MEAT… IT'S THE HUMANITY! I’ve been in a nostalgic Doctor Who mood recently so I spent last weekend rewatching the two movie adaptions of the long-running BBC science fiction series: Dr. Who and the Daleks, from 1965, and Daleks’ Invasion Earth 2150 A.D, from 1966. As a result I’m in the mood to highlight some of the movie posters used to promote the film. Produced by AARU Productions, and made on license from the BBC, Dr. Who and the Daleks marked the first time Doctor Who appeared not only on the big screen, but also in colour. 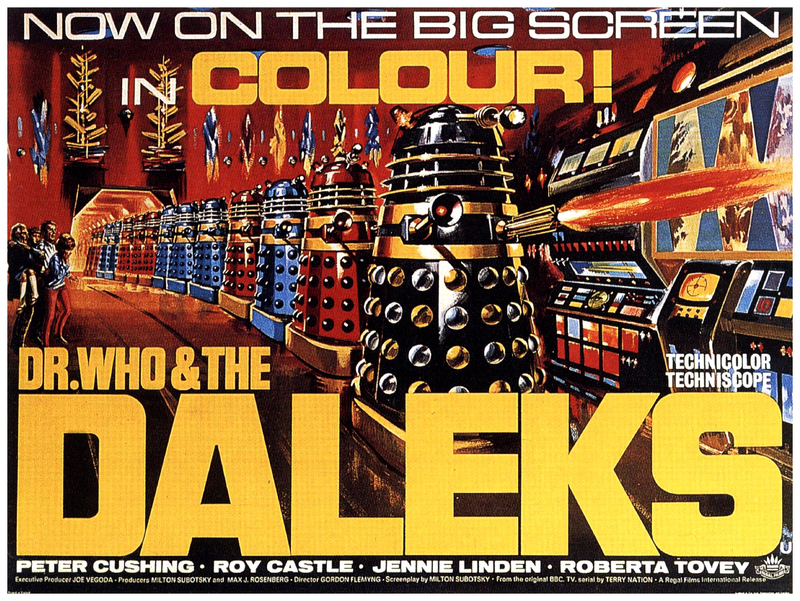 The story was a reworking of the Doctor Who story The Daleks, first broadcast on the BBC on 21 December 1963. For this big-screen version changes were made to the main character, portrayed by Peter Cushing (the producers felt that William Hartnell, the TV version of the Doctor wouldn’t be a big enough draw for American audiences). For instance, instead of the Doctor being an unnamed alien travelling through time in his TARDIS, this version was a human inventor (actually named ‘Doctor Who’) travelling around in a time machine he built himself. Along with a small group of companions the Doctor lands on the Dalek’s home world where they help the peaceful Thrals overthrow and destroy their evil machine overlords. 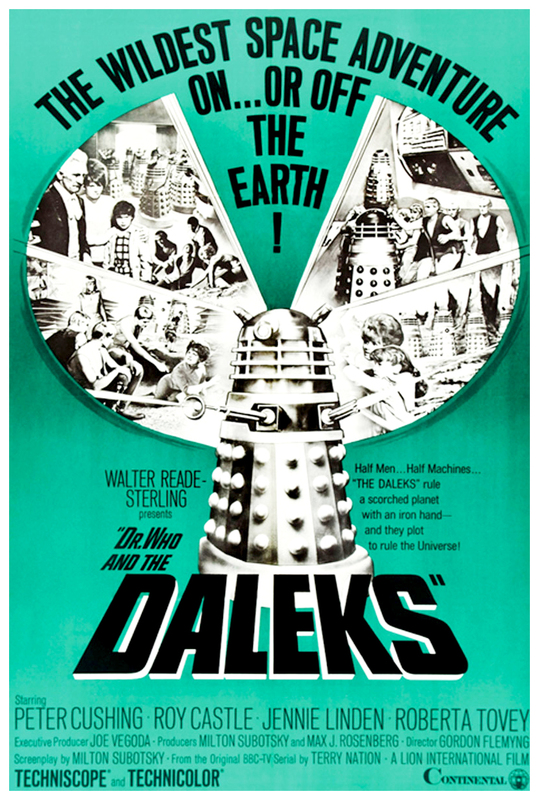 Dr. Who and the Daleks was a hit when released (mainly due to the UK’s fascination for all things Dalek), so a sequel was quickly green lit — Daleks’ Invasion Earth 2150 A.D — again based a Doctor Who story broadcast on the BBC on 21 November 1964. In the second film the Doctor and his companions travel to Earth’s future and liberate the world from the Dalek’s tyranny. Sadly, as entertaining as they are, the films themselves are not great. 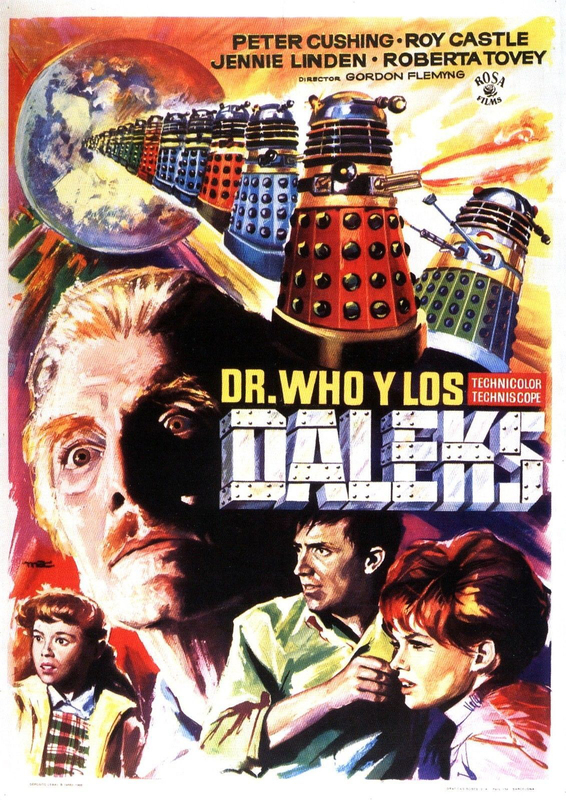 Dr. Who and the Daleks (note the abbreviation of Doctor) is the better of the two mainly due to the inspired casting of Cushing, who does a great job as the Doctor. Sadly, the second film goes off the rails a little bit, and even though it was produced for more money it looks decidedly cheap. It also doesn’t help that Cushing was ill for part of the sequel’s filming, and had to be written out for a large chuck of the film while he recuperated. And the obvious product placement for Sugar Puffs breakfast cereal, doesn’t help. On the whole both films are a fun watch, but in cheesy kind of way, and they don’t really stand up to that many repeat viewings. The posters on the other hand are a different matter: there seems to be a strange inverse rule in cinema that states the cheesier the movie then the better the poster, and that’s certainly true in this case. 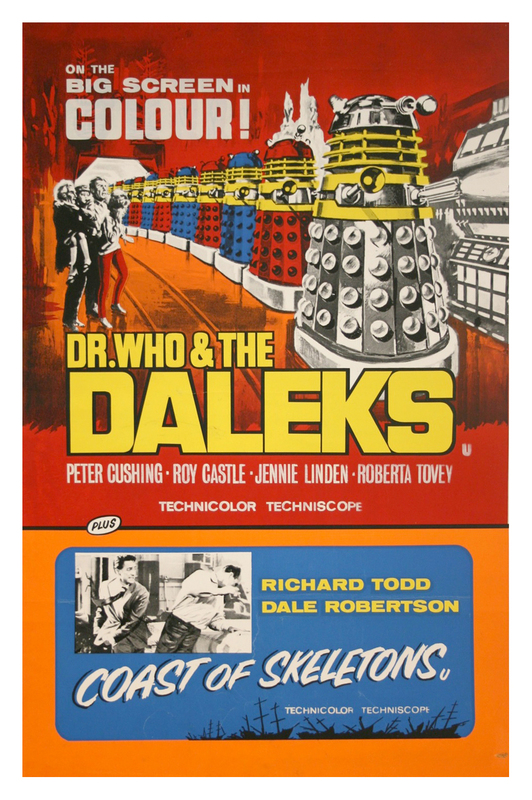 The reissue poster from 1967/8. 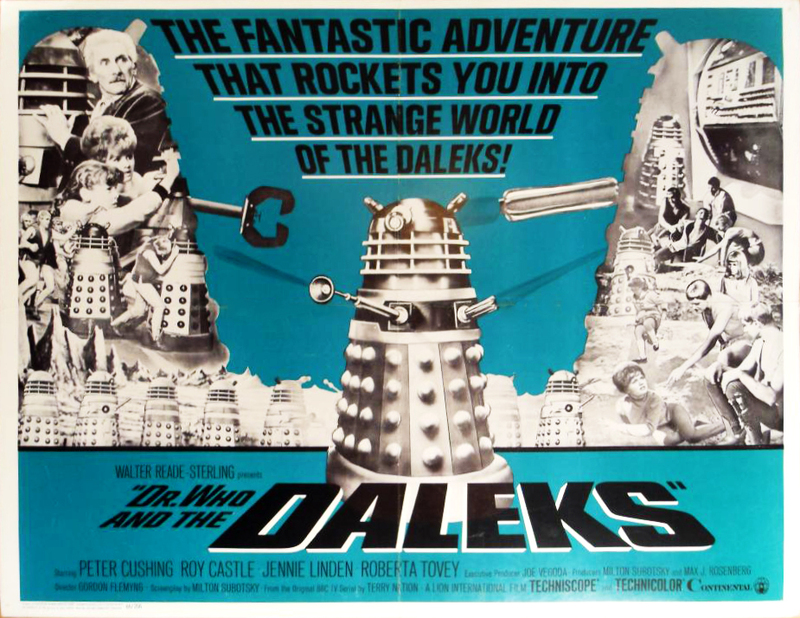 The UK posters for Dr. Who and the Daleks featured a striking illustration by Bill Wiggins, who painted a dramatic line of giant Daleks sweeping menacingly towards the viewer. 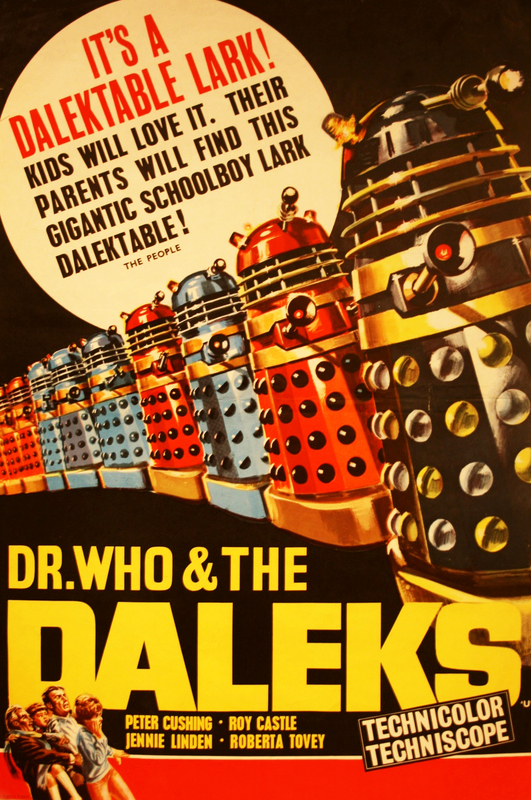 It’s also interesting to note that the word Daleks is twice the size of Dr. Who (the film’s producers clearly understood the film’s main attraction to a 1965 audience). 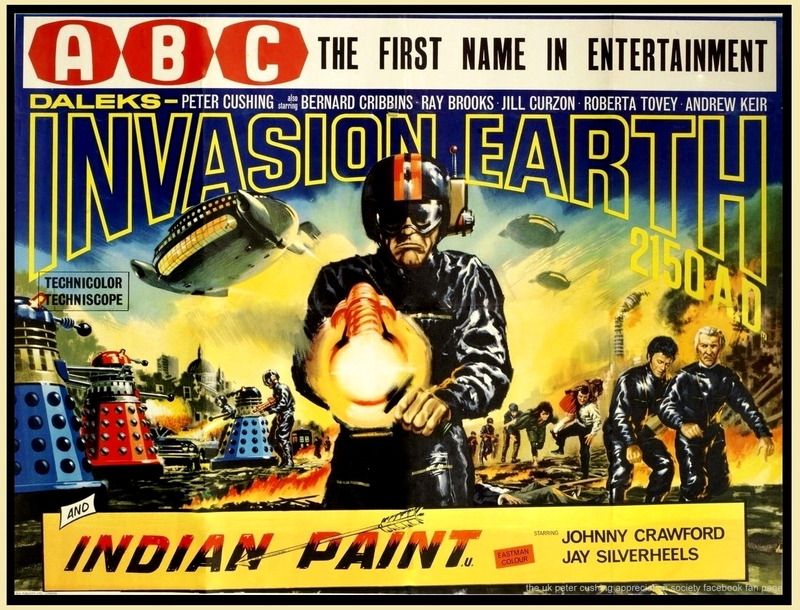 When the film was re-released three years later an eye-catching psychedelic yellow, green and red version of the poster accompanied it. By comparison the blue and black US posters appear decidedly subdued, although the typography is well done. And the Spanish version, although more traditionally painted, isn’t without its charm. 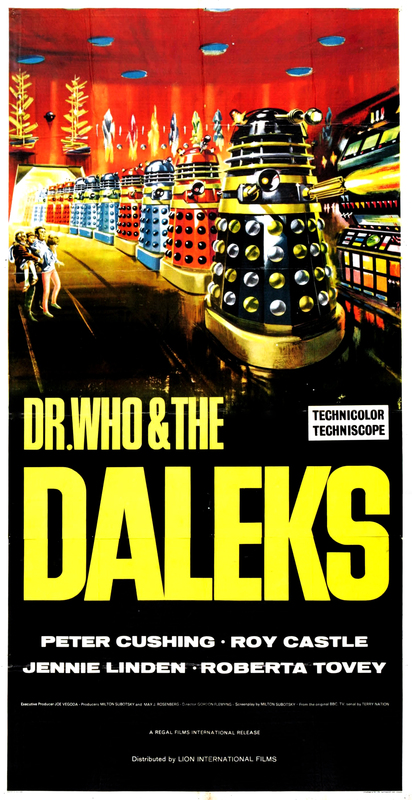 The US poster for Dr Who and the Daleks. 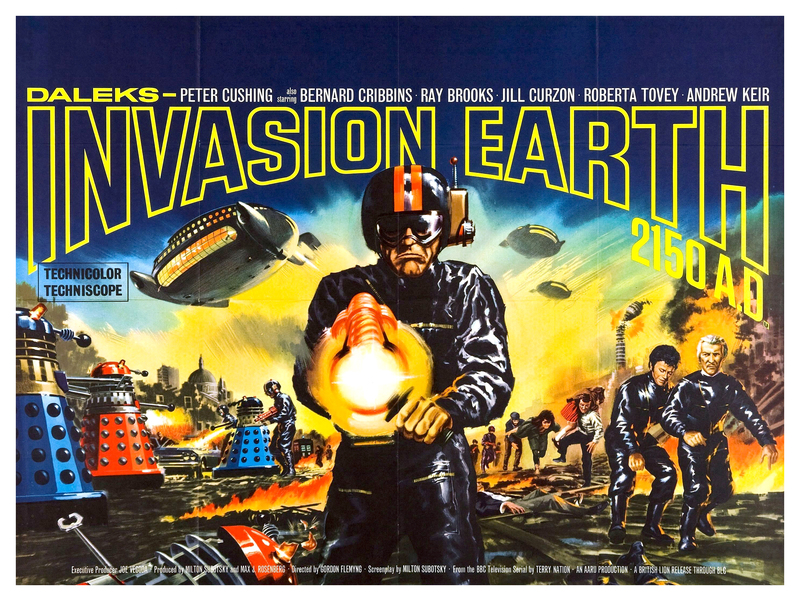 The posters for Daleks’ invasion Earth 2150 A.D featured another terrific painting by Bill Wiggins — I remember seeing this poster when I was a kid and been genuinely scared by the rather ominous machine-gun toting soldier in the centre of the image. The typography is also highly effective. 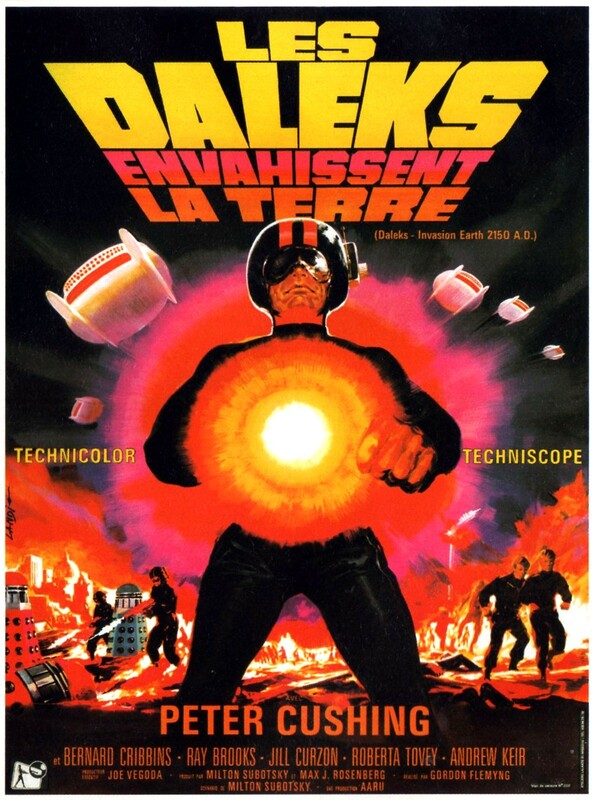 Other territories also adapted this image, including a rather eye-catching French version which also featured a glaring, psychedelic colour scheme. 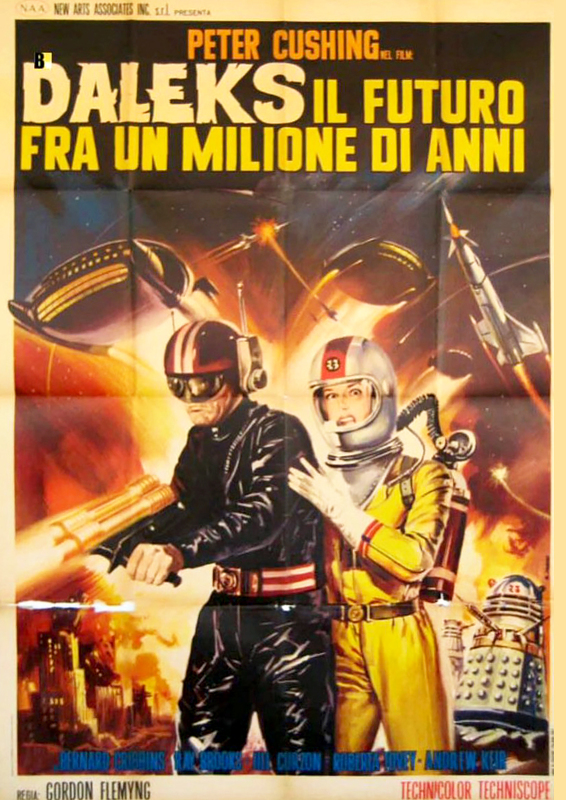 I also like the Italian version, although where the girl in the spacesuit came from I’ve no idea. And this time around the US market used the same Wiggins artwork, and who can blame them — it’s a fantastic image. 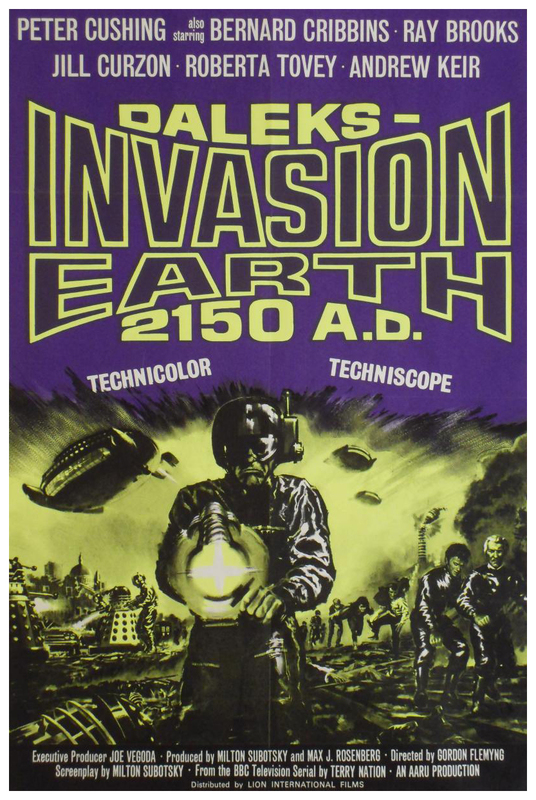 Below are some more variants of both the UK and international posters for Dr. Who and the Daleks, and Daleks’ Invasion Earth 2150 A.D.
UK front of cinema poster.